We are hearing a lot lately about U.S.-Russia relations, from the diplomatic kerfuffle over Edward Snowden, to tensions over intervention in Syria. Less visibly, U.S. and Russian interactions over a rapidly-changing Arctic are getting interesting. The U.S. and Russia have shared the Arctic since the former purchased Alaska from the latter (in its Imperial form) in 1867, but the effects of climate change may lead the two powers into uncharted waters, both literally and figuratively. 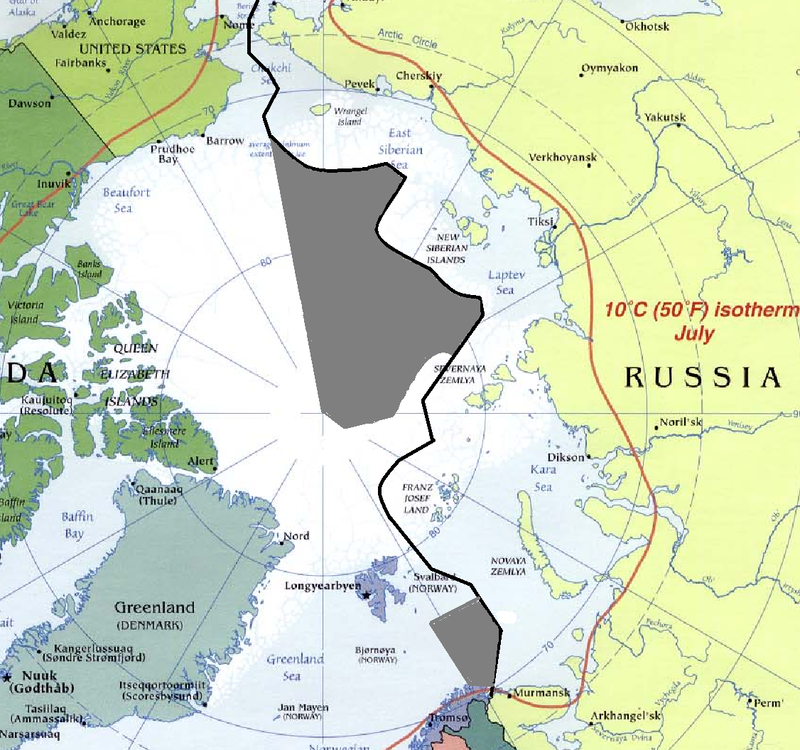 In a recent piece in the Moscow Times titled “Putin’s Blurred Arctic Vision,” Pavel Baev of the Prio Center sketches out Russia’s approach to the Arctic as defined by its recent “Arctic Development Strategy 2020.” The piece highlights Russia’s primary interest in natural resources, and its attendant interest in “expanding the legal boundaries of its continental shelf” as a means of laying sovereign claim to those resources. As the Arctic ice melts, this pursuit becomes more and more possible. It is important to pay close attention to the Russian point of view on the Arctic as ice melts, and sea lanes open up. The United States will assume the presidency of the Arctic Council in 2015, and though that seems far away, serious preparations for how to deal with the changing Arctic landscape will need to happen now. That includes being prepared to deal with claims issues, sea lane problems, policing questions, and possible strains on cooperation emerging from both the economic and climatic landscape. For example, both the United States and Russia face a greater need for ice breakers, as the navigable area of the Arctic increases, leading to an increase in traffic, a greater need for policing, and a possible increase in search and rescue (or SAR) operations. But in a climate of fiscal austerity, finding the funds for such expensive ships is very difficult. A lack of such capacities for the U.S and Russia in the Arctic could lead to a largely unregulated Arctic space, and a greater likelihood of human and environmental disasters occurring. Though such issues are not at all likely to lead to open conflict between Arctic nations, being prepared to keep cooperation between them on track, in the face of rapid changes, could go a long way, and not just in keeping the Arctic safe. The need for closer cooperation in a melting north might also lead to improvements in other areas of diplomacy, such as over Syria, Egypt, humanitarian intervention, international climate negotiations, and many others. U.S. ratification of the the UN Law of the Sea Convention, which is supported by a broad consensus of stakeholders including the U.S. military, the Chamber of Commerce and a number of major U.S. oil companies, has still not materialized. If it did, the scope of productive cooperation between the U.S. and Russia could expand significantly, in the Arctic and beyond. The United States and Russia have a rocky relationship, to say the least. A rapidly-changing Arctic complicates that. However, with adequate investments of political will and financial resources, the Arctic can continue to be a relatively safe and cooperative space. Hopefully, that cooperation can help lay the foundation for progress on pressing security, humanitarian and human rights questions across the globe. By Caitlin Werrell and Francesco Femia in climate and security on August 16, 2013 .